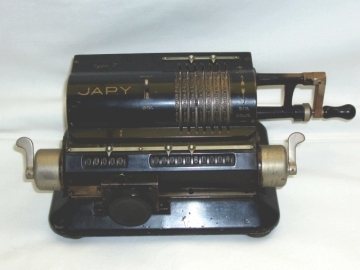 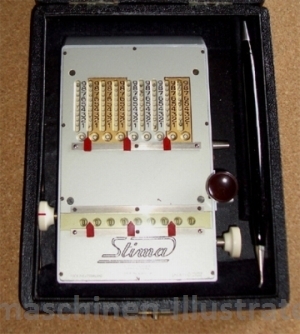 "In both size and shape, this machine closely resembles the Scribola, illustrated in figure 286 (32 X 9 X 7 cm, 2.5 kg), but instead of a chain drive it has ten adding keys. 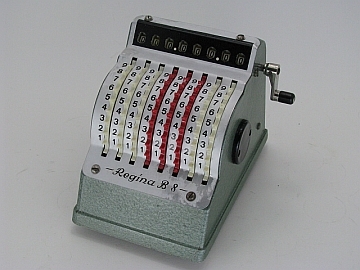 It prints both individual items and totals on 58-mm wide paper. 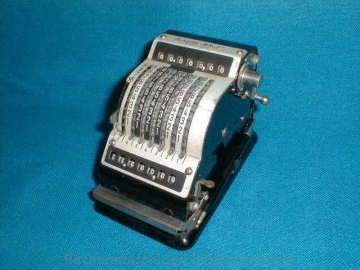 There is a lever, attached on the right, that is used to add and print the items that have been entered. 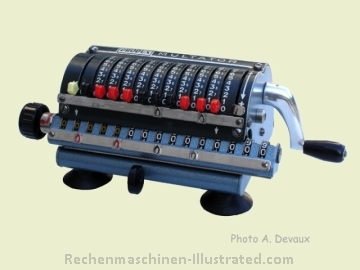 The totals are printed when the left lever is moved-it is not necessary to enter them again. 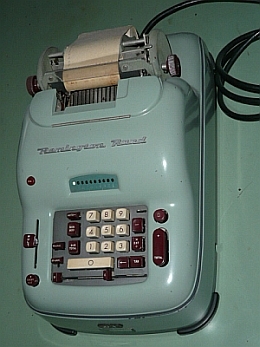 It has a single-color ribbon. 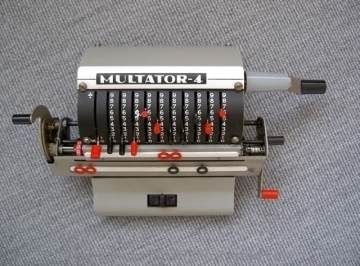 Capacity: eleven-place setup mechanism, twelve-place result mechanism. 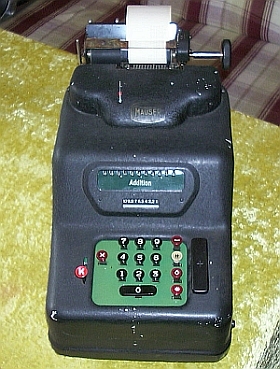 The price of the machine is 400 marks. 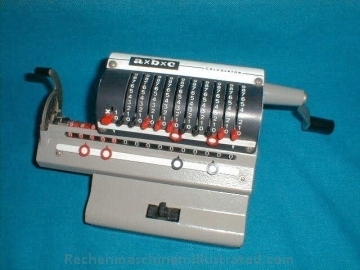 Manufacturer: Amigo Addiermaschinen Gesellschaft, 11 Müillerstrasse, Stuttgart-Gaisburg." 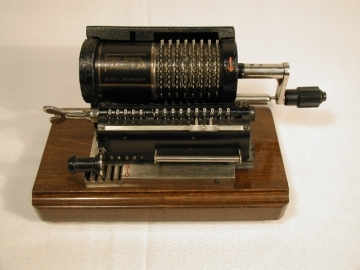 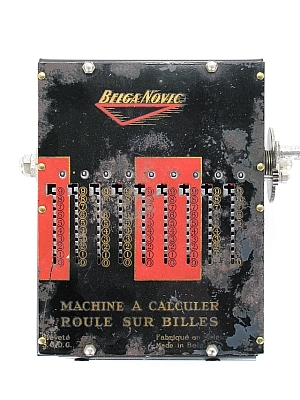 "This is a miniature pinwheel machine with continuous tens-carry in the revolution counter. 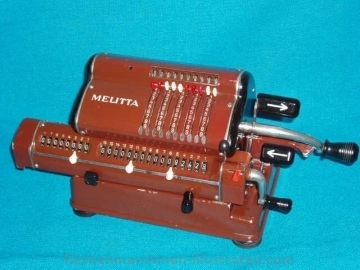 The shift from addition to subtraction occurs automatically when the crank is turned in the opposite direction. 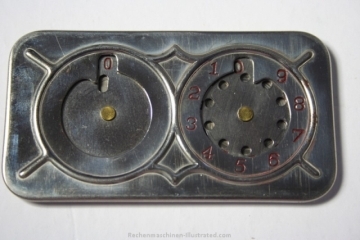 Manufacturer: Mercedes Bureaumaschinenwerke, Charlottenburg 2, Berliner Strasse 153." 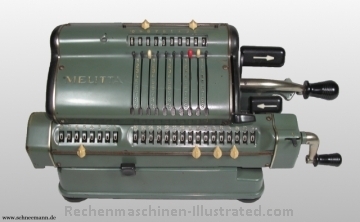 Melitta machines were manufactured by the Mercedes Büromaschinen-Werke, Zella-Mehlis, from 1924 on. 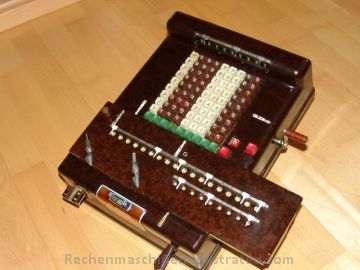 In 1926/27 production was turned over to the Walther Werke, also Zella-Mehlis. 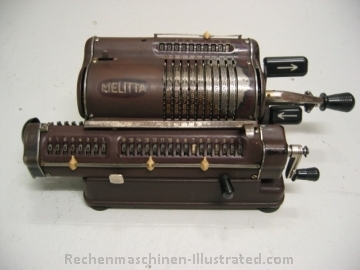 Identical machines were sold as Melitta and Walther by both companies. 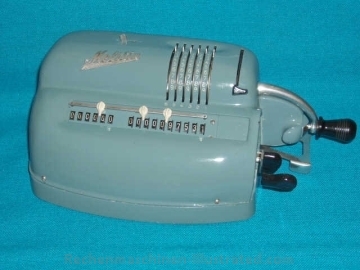 Melitta machines were also marketed by other companies under their brand, like Stolzenberg. 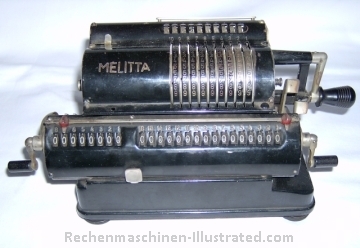 After World-War II, Melitta models were manufactured and sold independent from Walther (see below). 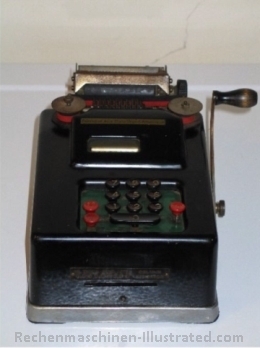 prod. 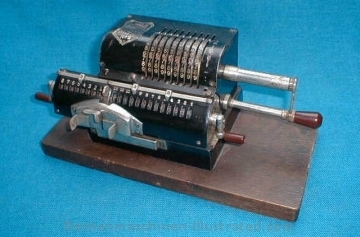 years 1925 - ? 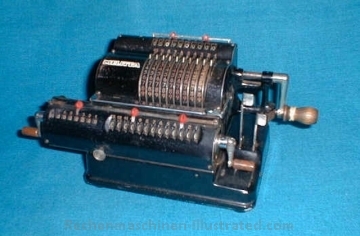 a number of years. 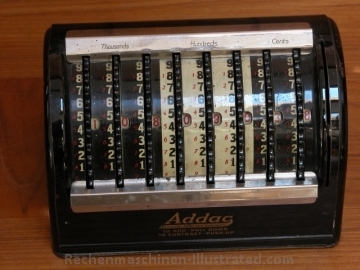 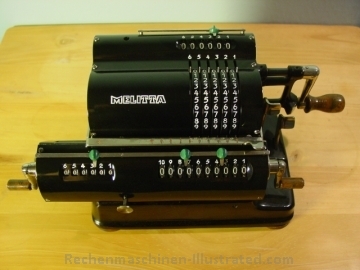 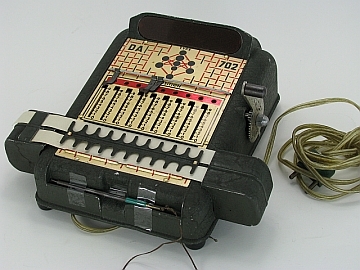 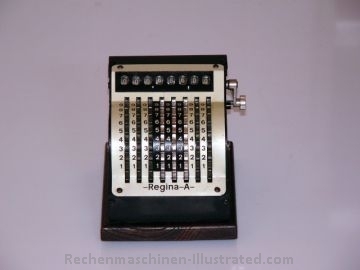 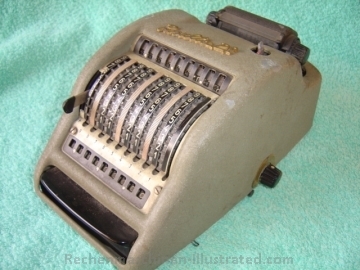 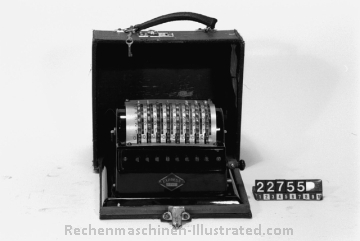 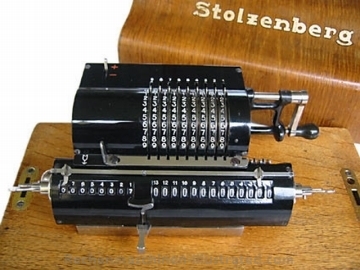 Manufacturer: Mercedes Bureaumaschinenwerke, Zella-Mehlis"
"Addac was a 8 digit adding- and subtraction-machine, manufactured by Addac Co., Grand Rapids, MI"
"The Express was a 7 digit adding machine with direct finger input, weight 3.5 kg, automatic tenth carriage, zeroing with butterfly screws. 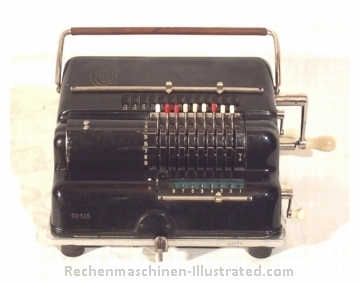 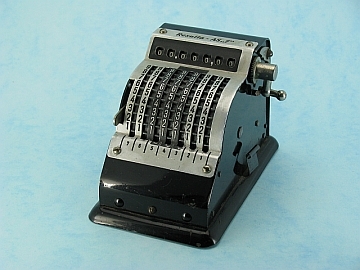 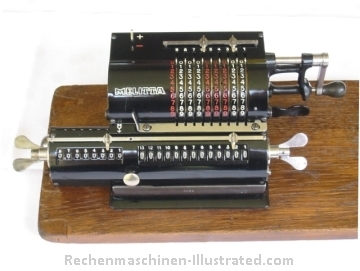 Manufacturer was Otto Rübner, Berlin, however since a couple of years the machine is not produced anymore"
Otto Meuter started 1918 with the invention of an add/subtract slider, which was marketed under the names "Addiator", "Pro Calculo" and "Correntator". 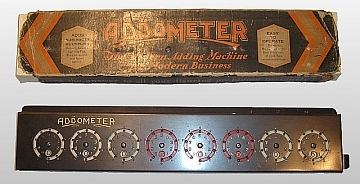 In 1928 he founded his own company and sold the add/subtract slider under the name "Produx". 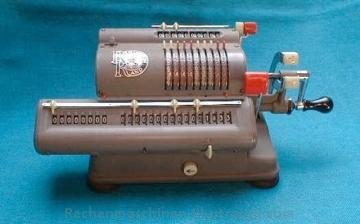 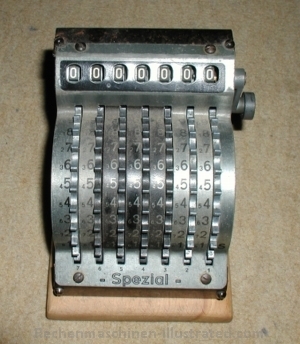 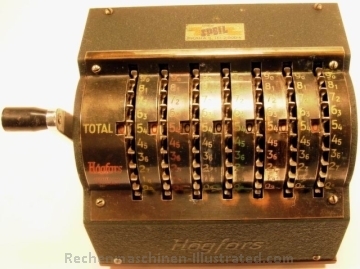 From 1953 a 3 species machine (division was not possible resp. 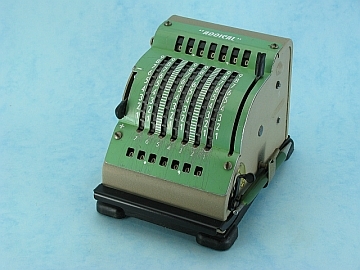 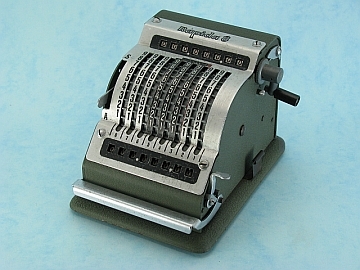 very cumbersome) was manufactured and marketed under the name "Multator" (in France "Multical"), one model had the name "a x b x c". 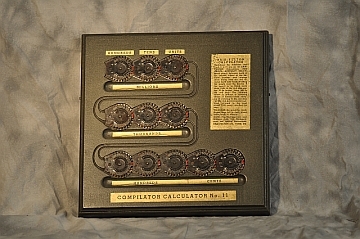 "Construction: Clyde Gardner, manufacturer: Gardner Calculator Co, Ebensburg, Pa. 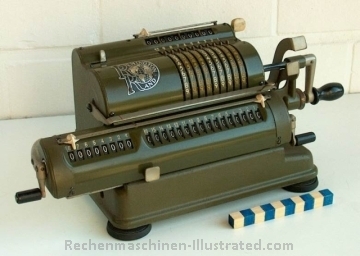 Since 1931 distribution of the machine thru the Monroe Company, since then the machines carry almost exclusively the name Monroe." 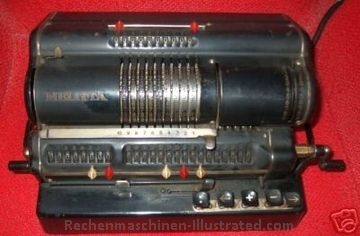 In 1929 the Hannovera company was in financial trouble. 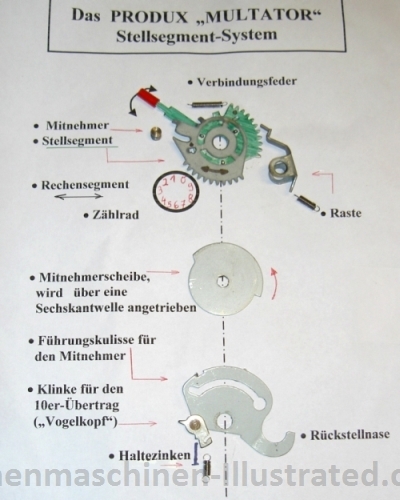 The Swiss company "EOS-Genossenschaft für Fabrikation und Vertrieb von Rechenmaschinen" bought parts and partly or complete assembled Hannovera CK and sold them under the name EOS. 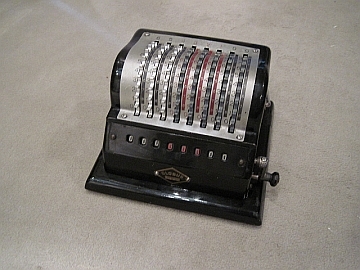 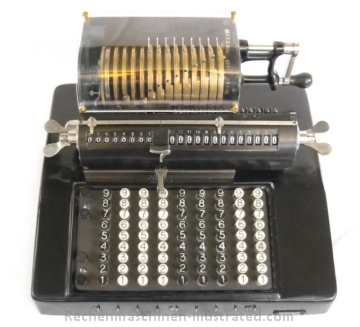 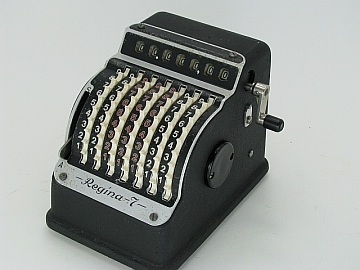 "The today known as Remington Portable writing 10-key adding machine was issued to the market 1929 under the name Brennan by the Brennan Adding Machine Co., 122, South Michigan Avenue, Chicago. 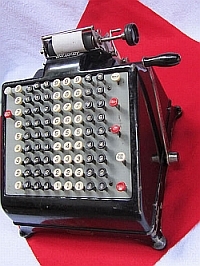 In 1932 the production rights were turned over to the Remington Typewriter Co."
"Small adding machine in the form of the known machines with catch tenth carriage, but with automatic tenth carriage up to the last digit. 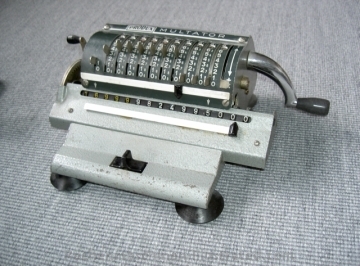 Manufacturer: Albert Steinmann, La-Chaux-De-Fonds, Suisse." 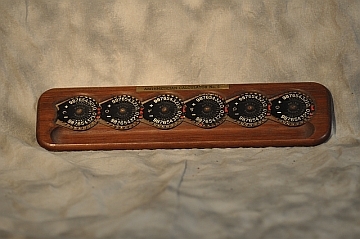 production years 1930 - ??? 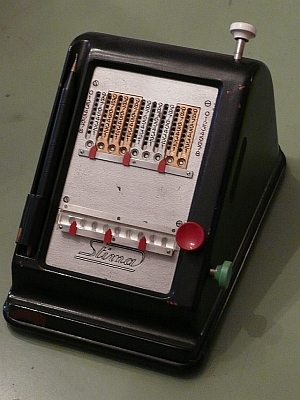 not well known machine from Sweden, similar to Addac. 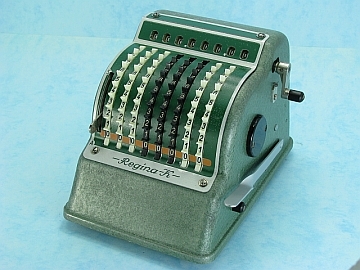 Sales by AB Affärsystem. 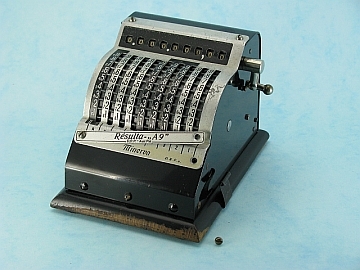 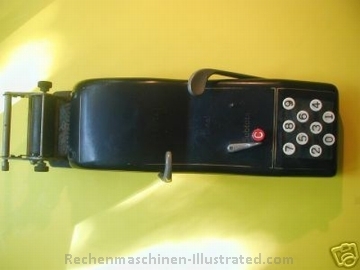 "The today's Plus was called originally Pettometer and was manufactured by Petters Ltd. . 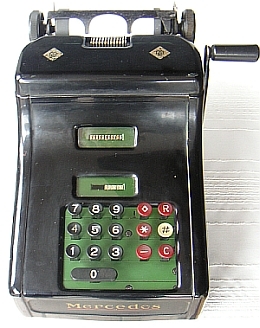 The manufacturing rights were transferred later to the Bell Punch CO, Ltd., a 1878 created company, which manufactures the machine in its factory in Uxbridge. 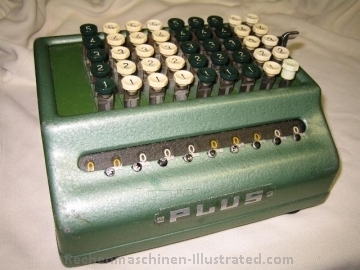 The smaller model is called Plus-Minor." 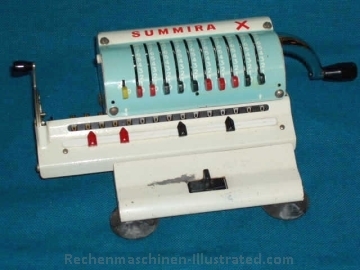 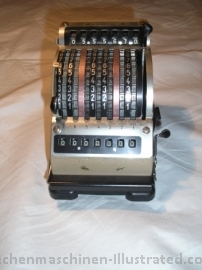 all adding machines from Bell Punch with half keyboard were marketed under the name "Plus"
Sumlock is the trade name for all Bell Punch adding machine with full keyboard. 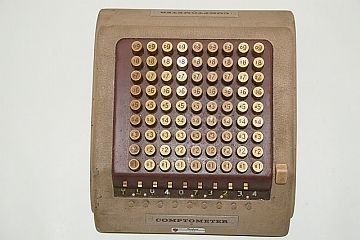 they are from the type of the Felt & Tarrant Comptometers.